Cee Dub is back with more Dutch oven and camp cooking! Similar to his other cookbook, this cookbook contains over 150 new recipes, photos, and stories. Some of the recipes in this cookbook are contributed by his friends. 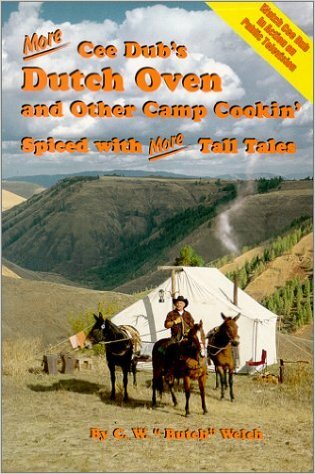 In addition to the recipes, this cookbook contains a wealth of information on how to select, care for, and cook with your Dutch oven. Did you know that folding a small piece of aluminum foil and sticking it under the lid while storing it can help circulate air into your Dutch oven and prevent it from rusting? This is just one of many tips! Cee Dub’s collection of mouth-watering recipes is certainly worth bragging about… Southwest Green Chili and Chicken Soup, Twice-baked Potatoes, Dutch Oven Halibut, Stuffed Flank Steak, Cherry Swirl Cake… are you ready to start the campfire yet?! This book has excellent reviews. You won’t be disappointed with this outdoor cooking investment.